Arlo has turned 5 months old this week. At times he still feels so little and new, and then at others it feels like he has been here forever!! It does feel like he has developed lots in the last 4 weeks and is really aware of what is going on around him so I thought I’d best get it all written down before it passes me by! Arlo loves faces! He loves it when we get really close to him – studying our faces, touching them and smiling lots!!! He also loves FaceTime which we do a lot with my parents and sisters- it’s becoming obvious that he is now engaging in these conversations. Arlo’s first tooth came through just before he turned 5 months and the second one has now appeared a few days after turning 5 months! They still aren’t fully grown and so we can enjoy gummy smiles for a little longer, but they are in and very sharp!!!! He was only a little bit grumpy at times, but calpol, bonjela and the magical camomile powder got us through!! Arlo was lucky this time to not have the bright red cheeks or nappy rash- just lots of dribbling!!! As Arlo has become stronger and more active, the jumparoo came out of the loft at about 4 and a half months. 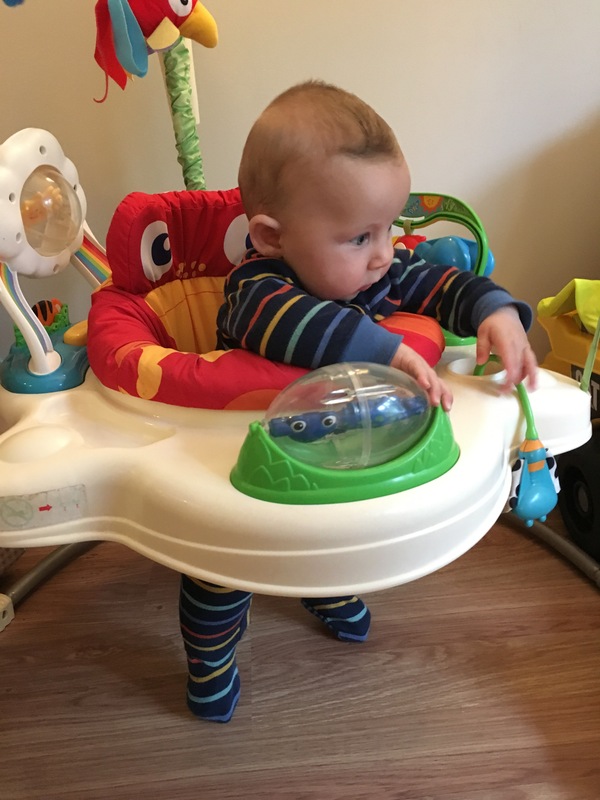 Arlo loved it straight away and we can’t stop him from bouncing now – those legs do not stop!!!! It’s really helped his swimming skills too- with good kicking legs getting him going in the pool. On the topic of swimming it has turned a corner in the last two sessions. 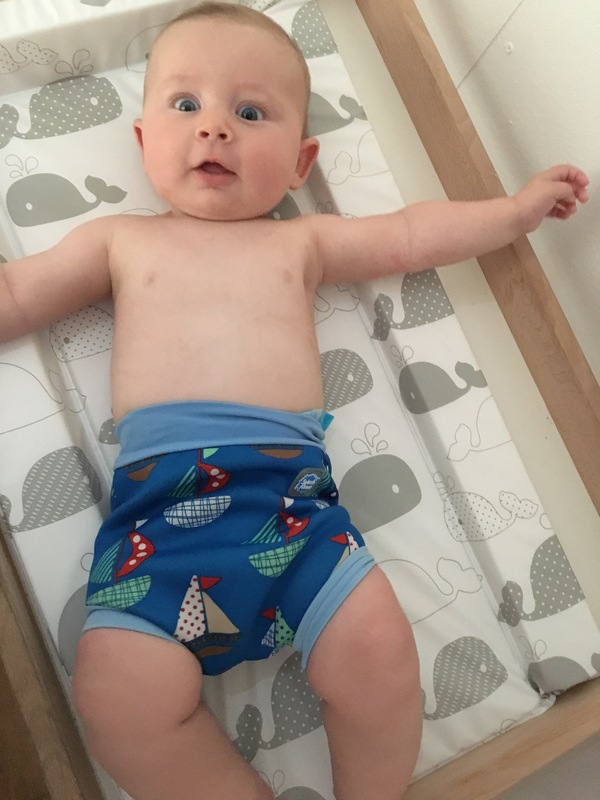 Arlo struggled with going under water, holding his breath for too long, then feeling a bit shocked by this and crying. However, in the last few weeks it feels like he is getting used to it- preparing himself before going under the water and being relaxed when he comes back up- so proud of him for getting the hang of it!! Arlo has also started rolling. He likes lying on his side watching his toys or the tv and is now quite often getting onto his tummy. He was getting his arm stuck underneath him, but the last few days has seen him sort that out. Scary that this is the beginning of having a little person who moves about!! Arlo still isn’t sleeping through the night! Lucky if we have one wake-up, usual to get two, gets frustrating at three!!! It does feel like he is beginning to sleep longer stretches though, so I’m feeling hopeful that one day I will sleep all night!!! He is now sleeping in the Travel cot instead of the Moses basket, which I had hoped would help, but it didn’t. I think he is enjoying the extra space though!! 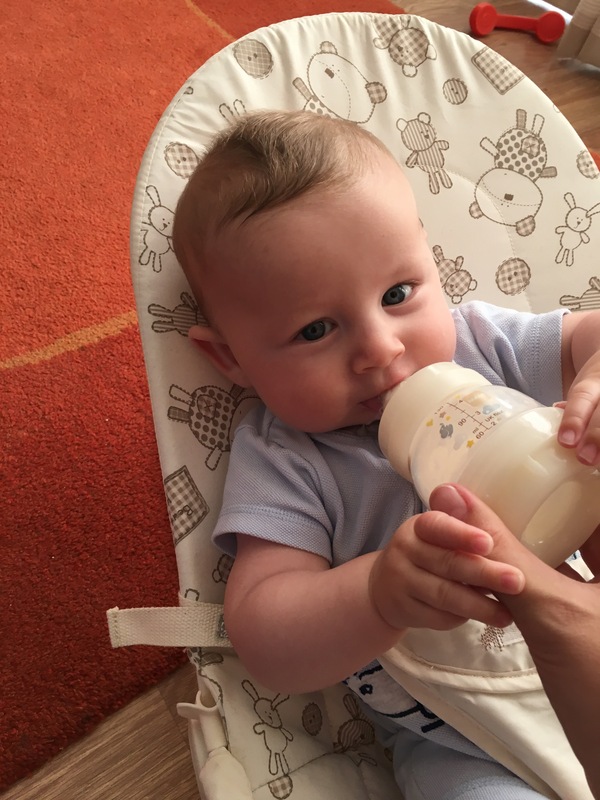 I do feel like I’d like to give him a bottle of formula in an evening to see if that could help, but he still won’t take a bottle. We try daily, but aren’t getting anywhere. We will persevere though!! 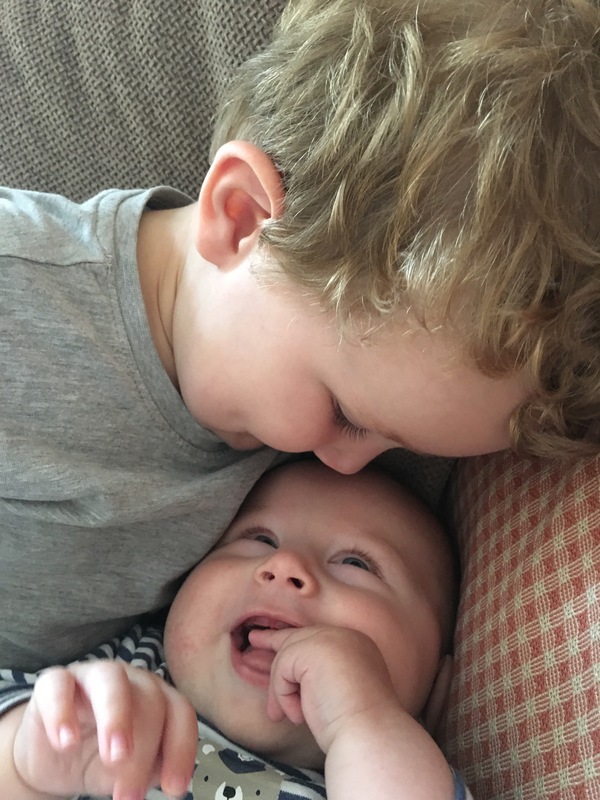 So all in all we continue to be really lucky that our baby boy is a happy, relaxed little man, and I love watching the relationship grow between Woody and Arlo. Posted in Baby. Tagged 5 months old, Baby, baby development, little brother. 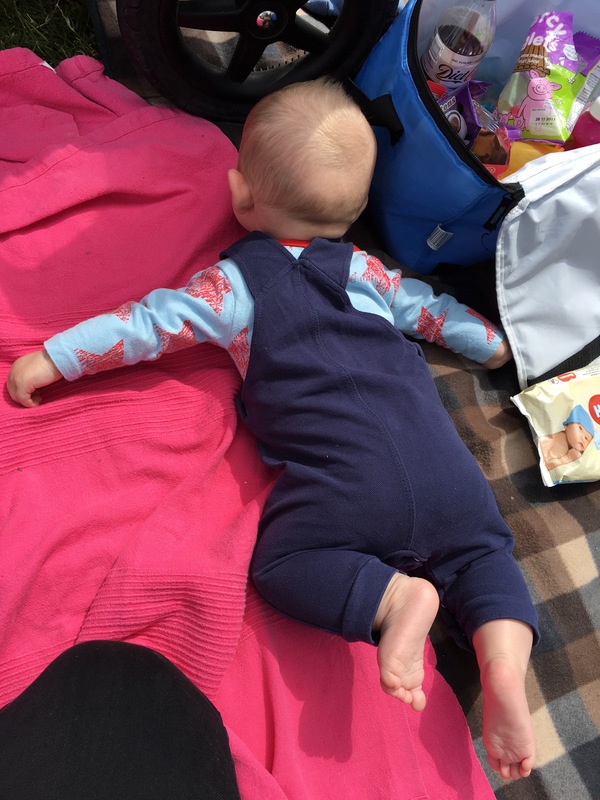 Next: Next post: Early weaning….